This year’s St. Patrick’s Day had crowds ranging from 12,000-15,000 people throughout the day. The surrounding corridors of Ezra Avenue, Bricker Avenue, Clayfield Avenue and Albert Street had the most traffic. The St. Patrick’s Day events that take place within the Wilfrid Laurier University community are notorious for their outlandish festivities and this year was no different. The events that took place on Ezra this year involved months of planning from the Waterloo Regional Police Service and community stake holders. “It was a very busy day in the sense of there’s a lot of planning and operational planning and coordinated resources over the course of the day. The operations started at about 8:00 in the morning and really last up until 3:00-3:30 in the morning the next day,” WRPS police chief, Bryan Larkin, said. According to Larkin, there were 208 charges pressed in total — 11 of those being criminal offences. “We laid about 208 charges, 11 of those are criminal and a balance of those are provincial offences and the majority of 197 were really related to liquor violations,” Larkin said. “With the majority [of the charges] being consuming alcohol in a public place as well as several public intoxication tickets and then some bylaw offences, public fouling and a couple of traffic offences, a couple of minor trespassing on private property charges,” Larkin concluded. Although St. Patrick’s Day is famous for the sea of green that takes over Ezra Street, Larkin believed that although there were arrests, the day could have went a lot worse. “In and around the university district we had four arrests, which when you put it [into] perspective [are] fairly relatively acceptable numbers. Our goal is not to have to arrest anyone and that people would be respectful, but for the most part I think we accomplished what we set out to do,” Larkin said. “What’s concerning is the amount of injuries and medical related calls that the paramedics had to address and deal with the impact of our local emergency rooms and hospitals are affected, but again, you bring that many people together there are challenges and issues,” Larkin said. In addition to the criminal charges, as reported by CTV Kitchener, there were three charges of assault, two charges of an offensive weapon, two charges of drug possession and one charge of impaired driving. According to Larkin, there was one reported complaint of sexual assault the WRPS are investigating. “What worries me is the amount of drinking that goes on and people make decisions that are not necessarily appropriate … people prey on the vulnerable. They see someone that appears intoxicated or inebriated and people get taken advantage of,” Larkin explained. 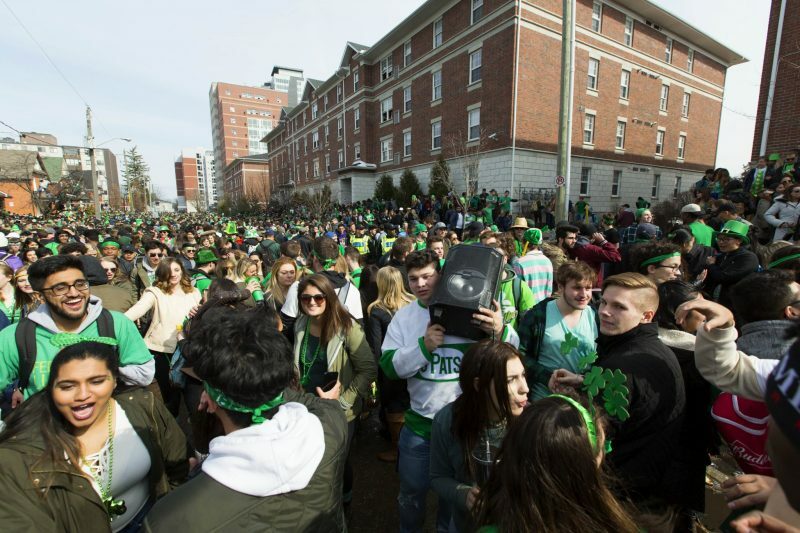 Larkin also explained that alcohol consumption is at the forefront of major issues during the St. Patrick’s Day festivities, as well as it is a major issue for the university culture in general. “I’m still very concerned about the binge drinking that occurs during this event. It’s worrisome and I think that moving forward from a public health and public education perspective, we can ensure that the festival goers are healthy because it’s an unhealthy approach [to binge drink],” Larkin said.